Internets! Why, oh why have I not been to Portabla before? I drive past it all the time. Heck, I walk past it all the time. And yet I’ve never stopped in. Until today. 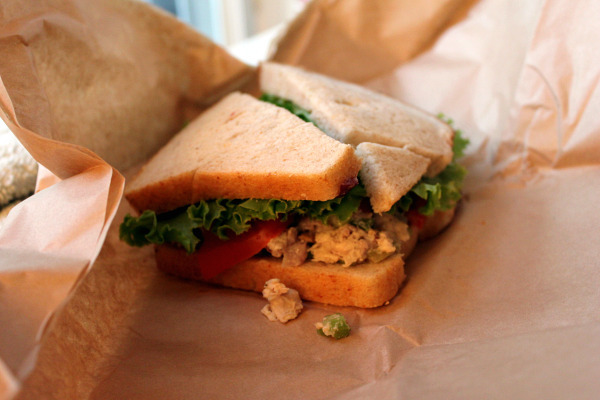 A chicken salad sandwich made with local, all-natural chicken, celery, onion, cranberries, almonds and mayo on sourdough bread. 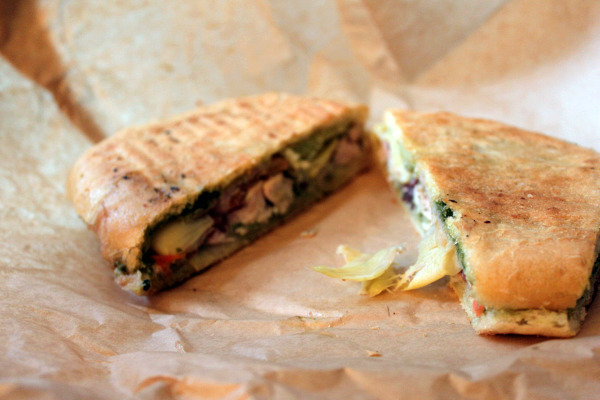 A Mediterranean panini stuffed with artichokes, olives, pesto and chicken. The bread is crispy-chewy, toasted but not scorched. 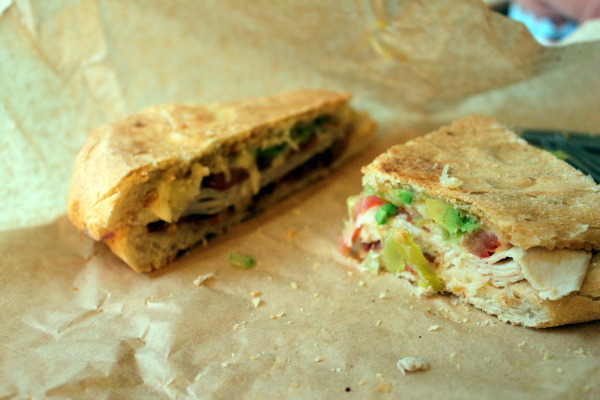 A Santa Fe panini, stuffed with house-roasted turkey (that actually tasted like turkey), bacon, avocado, pepperoncini and chipotle mayo. I could not believe how wonderful the turkey breast tasted. 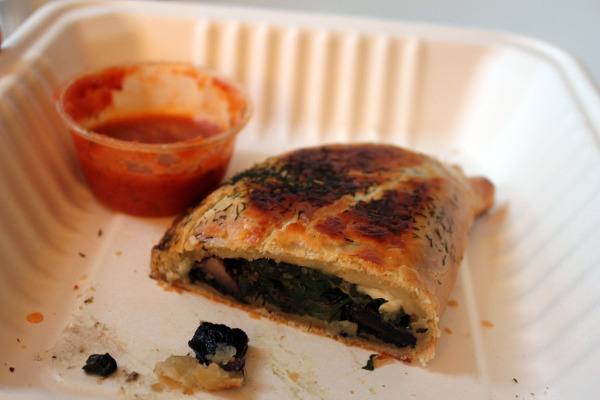 A vegetable-goat cheese empanada, full of well-seasoned mushrooms and spinach, with the thickest, flakiest, most tender and delicious crust EVER. Buttery, chewy-crisp cookies, one with chocolate and pecans, the other vegan, and so surprisingly buttery-tasting. They’ve just started serving brunch on the weekends, and I think I’ll have to stop by very soon. I saw lox with capers and creme fraiche on the menu, as well as eggs benedict made with meatloaf instead of Canadian bacon. I can’t wait! I’m so jealous! The food looks so darn good! Any photos of the interior? Can you use the internet there?? I did get a couple of photos of the interior… I’ll try to get them up on flickr soon. I didn’t even notice if they have wifi available, but I’m sure they do! Yes, we love Portabla! We had their breakfast tacos once though and weren’t that impressed. Kinda small and expensive for waht they were. But everything else is so good! If they ever have beef stroganoff when you go, you MUST get it. It’s so good! I LOVE Portabla! They have some of the best sandwiches, soups and cookies in the city. On Fridays they do a turkey burger panini that you must try. It’s also great for a dinner party. You can reserve the restaurant and they will create a menu for you and let you BYOB. The staff there is so friendly. It’s one of my favorite spots in the neighborhood! Oooh, a party sounds like a great idea! Oh boy do I love Portabla! I always get a plate of three veggie sides which are amazing and their soups are the best I have ever had – you have to try them. So excited they starting serving brunch on Sundays!